Gorge Net » VOIP Install Instructions | Life. Business. Uninterrupted. This guide assumes you have a Wireless Router. Plug one end of an Ethernet cable into the blue Internet port on the Phone Adapter, and plug the other end into one of the ports labeled 1-4 on your wireless router Note: We highly recommend using either a TP-Link or a Linksys router. 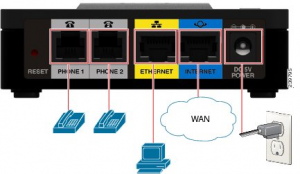 Your VoIP service may not function properly with other router brands. Connect the power adapter included from an electrical outlet to the Phone Adapter. Once the device is powered up, the Power, Internet, and Phone 1 lights should turn on and your phone will be ready to use. The image above shows a Wall Jack (Far Right), DSL Modem (Right), a Wireless Router (Middle), a VoIP Phone Adapter (Left), and a regular wireless phone (Far Left). A phone cable connects the modem to a wall outlet (Far Right), a network cable connects the DSL Modem to the Wireless Router (WAN Port), and another network cable connects the Wireless Router (Port 1, 2, 3, or 4) to the VoIP Adapter (Internet Port). 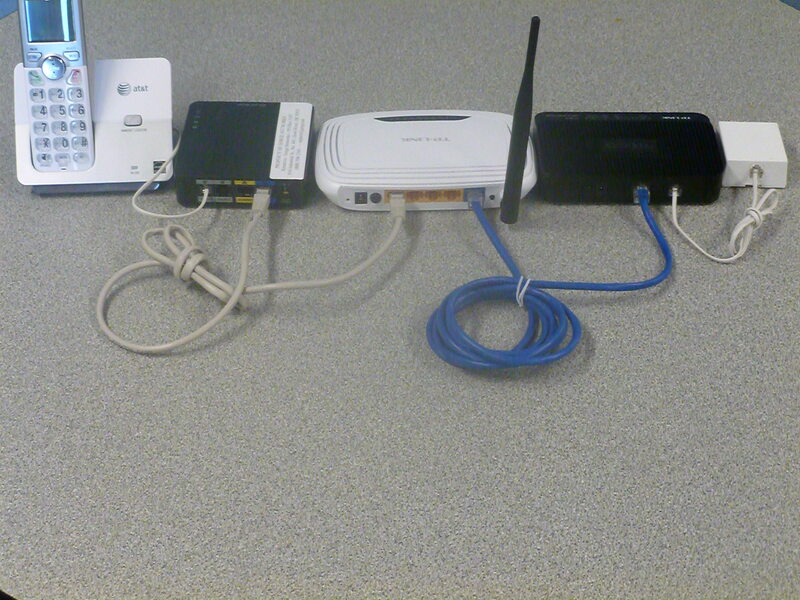 The phone is plugged in to the Phone 1 port of the VoIP Adapter. Note: No power cords are currently plugged in, and each device requires power to function correctly. 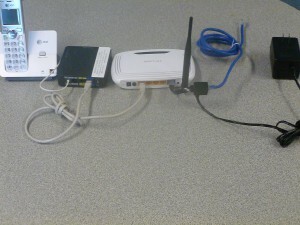 The image above shows an antenna power cord (Far Right) which connect in to a cable going to your dish (Right), a Wireless Router (Middle), a VoIP Phone Adapter (Left), and a regular wireless phone (Far Left). This is the setup for a wireless connection (If you have a dish on your building). Note: No Power cords are currently plugged in, and each device requires power to function correctly.